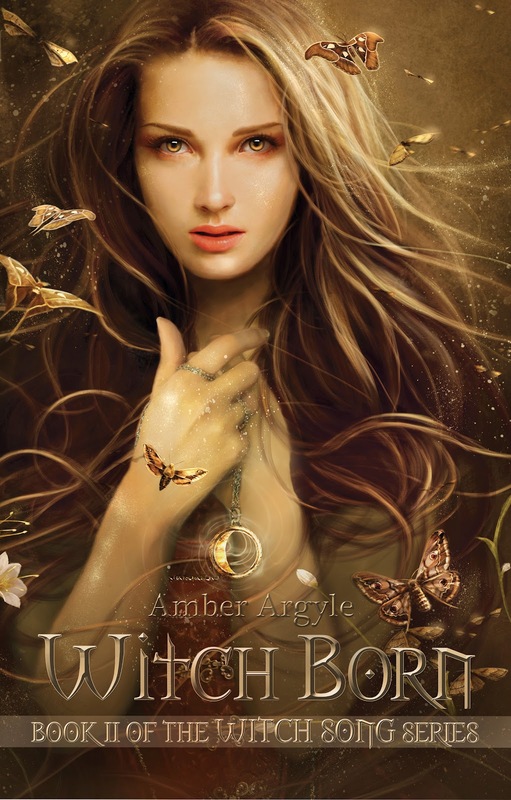 I have some excitement for today, A sneak peek for Witch Born by Amber Argyle, the second book in the Witch Song Series!! Would you like to see the FIRST chapter?? Well, Here it is!! The night was so deep the shadows seemed to bleed darkness. Senna glanced toward the hidden sky, searching for the moon that would not come. Not tonight. Even the strongest starlight was strangled by the dense canopy of trees. The temporary blindness was frightening, but it ensured no one would notice her slipping away. With each step she took, the roar of the waterfall grew louder. Finally, she reached the staircase carved into the side of the cliff. Mindful of the slippery steps, she climbed upward until her muscles burned and sweat broke across her skin despite the chill. When she’d crested the top and crossed the bleak expanse, she glanced at the frothing sea far below. Sea spray misted her skin. She faced westward, towards the distant land of Tarten. Closing her eyes, she cast her senses across the vast ocean, searching and feeling the faraway echoes of the Four Sisters—Earth, Water, Plants, and Sunlight. She concentrated until she could hear their pain, an aching melody. Senna’s tears started again, wetting the salty tracks already on her cheeks. At night, her dreams haunted her. Dreams of a withered land and a dying people. With all the strength she had, she sang. Destroy a land of natural riches. This terrible and unjust curse. She came to the cliffs every night she could manage to slip away. Hoping to right the wrong she’d done, she sang for Tarten—the lands she’d helped destroy months ago. When her throat was scratchy and she could no longer hit the high notes, she stared at the land she knew was struggling to hold onto any life at all. Because of the Witches’ curse, no rain had fallen in Tarten for over two months—death to any jungle, but this one held on deep in the ground, waiting for the promise of her song to be fulfilled. She withdrew her senses back to her home, Haven. Above the crash of waves, Senna thought she heard the scuff of a boot against stone. She whipped around and peered in the direction she’d come, her heart pounding in her throat. If the Discipline Heads discovered she was subverting their curse, the punishment would be severe. No answer. She wished Joshen were here. The Discipline Heads had done their best to keep her apart from her Guardian. She hadn’t seen him in two months. Not since he and Leader Reden had gone on a recruitment assignment. Hugging herself, Senna trotted back to the staircase and began the long descent into the uninhabited quarter of Haven. At the base, she plunged between trees that towered above her, the tallest over eight stories high, the smallest just over two. Some were so wide it would take twenty witches stretched arm to arm to encircle one. Each tree was hollow and had once been inhabited by a Witch. Now they were empty, proof of the Witches’ lingering decline into ruin. Here, everything still bore faded signs of the Witches’ final battle with Espen. A door in a tree creaked on its rusted hinges, a hole yawning where the latch should have been. Broken windows gaped like mouths with hungry, serrated teeth. The destruction was at odds with the life bursting all around. Still, Senna couldn’t shake the feeling she wasn’t alone. There was no indication anyone had marked her sneaking away, no indication she’d been followed. But some instinct inside her seemed to chant a warning—through the gloom, someone was watching. The feeling grew, and with a start, Senna heard music again. But this wasn’t the distant music from Tarten. This was closer. Here. She halted and tipped her head toward a sound so soft and natural she realized she must have been hearing it for a while and mistaken it for the sounds of nature. But there was no mistaking it now. The melody carried a warning. The wind picked up, snaking along the path and tugging at her cloak. Senna held her hood close. The thick vegetation before her shifted against the breeze. Someone was coming. Trying to calm her ragged breathing, she reminded herself she was safe on Haven. The Witches’ headquarters were an impenetrable fortress—surrounded on all sides by cliffs that were in turn surrounded by the frigid ocean. The only way in or out of the island was for a Witch to sing you through an underwater cave. So this was simply another Witch out for a stroll in the middle of the night in the abandoned part of Haven. The witch would see Senna and wonder why she was out for a stroll in the middle of the night in the abandoned part of Haven. The tempo increased, matching the pounding of Senna’s heart. She backed off the path and hid behind a plant with leaves the size of her chest. Her hand strayed to her seed belt, her practiced fingers automatically finding the pouch of Thine seeds. She waited, as motionless as a mouse at the mere whisper of a wing. A figure emerged onto the path, features hidden by the dark. Coming level with Senna, a muscular hand brushed some of the overgrown vegetation out of the way. The hand was distinctly male, but there were no men on the island. They weren’t allowed, not without the Discipline Head’s permission. If this man shifted a mere fraction, he would touch her cheek. She gasped softly. He paused and cocked his head as if listening. Holding her breath, she closed her eyes so they wouldn’t catch a stray bit of light and reveal her. The man hesitated before moving forward, his pace faster this time. Senna let out her breath in a rush. She bit her lip as the man disappeared back into the shadows that had birthed him. Steeling herself, she stepped onto the path. A man where no man should be? Perhaps she was mistaken. After all, it was so dark. But there was a way to find out. Obscured by time and neglect, the gravel path held a perfect imprint of a boot. She eased her foot inside. It was easily half a dozen sizes bigger. She hadn’t been mistaken. But why was a man here? The music changed, luring her forward. Her fingers buried in Thine seeds, Senna slipped after him. She kept him just in sight—the solid darkness of his form, the scrape of his boots. He rounded a bend. She crept forward, but when she glanced down the path, he was gone. She paused, listening. The hollow tap of a boot on wood. There. He was slipping up the steps to a tree house. Dropping into the shadows of the plants, Senna parted a leafy branch and peered upward. The man glanced around before tugging the door closed behind him. It shut soundlessly, as if someone had oiled the hinges recently. Senna heard voices that were too muted for her to make out the words. The tempo of the music picked up, pounding out a savage beat. Something was wrong, and she had to know what. Her breath catching in her throat, she eased silently up the steps. At the top, she couldn’t help but notice the creepers had been carefully pulled away from the doorframe. Whoever this was, they’d met here before. Senna peeked past the vines that partially covered one of the broken windows. Through the gloom, she could only make out two distinct silhouettes. That meant there wasn’t just one man on the island. There were two. “Why?” asked a bass voice. Senna gripped the sill until her fingers ached. Why would anyone attack Haven? And who would help them? A vague shape started toward the door. The music grew louder, pounding a warning. Hauling her skirt above her knees, Senna ran. Her cowl slipped off her head. She glanced back. Her hair swept over her face and partially blocked her view, but she could see two hooded figures chasing her. The smaller of the two stopped and swung something around above his head. A rhythmic, whooshing sounded around her. Before she could understand what was happening, something solid smacked into the back of her head. Lights exploded behind her eyes. She pitched forward and hit the gravel hard. And then he was on top of her. Senna didn’t have time to think. Acting on reflex, her mouth opened and a song poured forth. Bind him, though he flails and fights. A rustling slither filled the air as the plants responded. The man yanked her into his chest, into his arms. His breath washed over her face—he smelled of something dark and sweet, like licorice. Repeating the same verse, she tried to kick free, but his grip was too tight. A vine shot past her and snatched his arm away. More plants responded, twisting around him and pinning his other arm. Still singing, Senna kicked her way out from under him. One more song, and he’d be wrapped up completely. Something snapped behind him. She had forgotten about the tenor! She clambered to her feet, a song on her lips. Before the first syllable fell, he barreled into her. She slammed back into the dirt. He shoved a gag into her mouth. Knowing how vulnerable she was without her song, Senna drove her elbow back, catching his wiry frame in the gut. The attacker grunted in pain. His grip loosened enough for her to spit the gag out. But she didn’t have enough breath to sing. She twisted until she was chest to chest with him. All she saw was a face wrapped in shadows, dark eyes glinting. She punched as Joshen had shown her, putting all her strength into it. An explosion of pain spider-webbed through her hand. Her attacker tottered. She shoved him. The man tried to hold on, but his movements were slow and clumsy. Senna kicked her way free and started running. She panted out a song. She was too winded for the song to be very effective, but it was the best she could manage. At the sound of a sawing knife, she knew the smaller attacker was freeing the larger. They’d be after her soon. Even with her song weaving the plants behind her, Senna didn’t think she could outrun two men. She needed some kind of weapon. Her head whipped from side to side as she searched for something. All she saw were enormous plants, broken doors, and windows! She darted into the dense foliage. Plants whipped her face, stinging her eyes. She erupted onto another of the hundreds of Witch-sung paths that wound between Haven’s trees. She followed it for half a dozen steps before darting back the way she’d come. Beneath a tree’s broken window she flattened herself against the ground, her face pressed into the damp soil. Her movements slow and even, her fingers searched for a piece of glass to use as a weapon. All she could find were worthless bits. She froze as footsteps pounded past her. The men paused uncertainly, but they were good at this game, better than her. Without a word, they split up. Senna could hear them hunting for her. She tried to slow her breathing. Sweat soaked through the back of her dark green dress. She started searching again. Something sliced her finger—a shard of glass about the size of a knife blade. Keeping her movements smooth, Senna wrapped the edge of her cloak around her hand and picked it up. She chanced lifting her head. Sweat rolling down her temples, she listened for any sign of the men before she scooted backward. When she bumped into the tree house, she eased to her feet and edged to the other side. Now she was near where they’d first attacked her, hopefully the last place they would think to look for her. Her heart pounding in her throat, she waited. Nothing. She moved away from the tree, toward home, her senses straining for any sign she’d been spotted. Some instinct made her turn around. By then it was too late. The gag bit into her mouth and the knot pulled tight. But the attacker had underestimated the rest of Senna. She whirled and struck with the glass shard. A gasp slipped from his lips. Under his hood, the bass’s eyes went wide with shock. A gush of warm blood soaked Senna’s hand, and she stumbled back in horror. AND there’s more!! GO to this link HERE for Chapter 2!! For an ebook of Witch Born, enter by Rafflecopter!